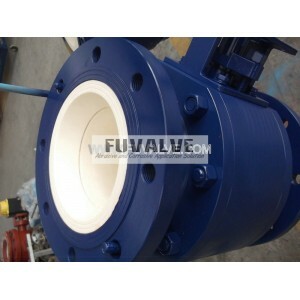 The V-port full lined hard-seal ceramic control ball valves are applicable to a variety of pipes like Class15./300 and PN10-PN50,suitable for the controlling or cutting of medium in the high-wearing or corrosive working conditions.If select different materials,the valve can be applied to water,steam,oil,lime slurry,liquid chlorine,nitric acid,acetic acid,oxidizing substances,urea and other medium. V-port valve ball and seat generate cutting force,when the medium contains fiber,solid particles or slurry,the valve will not be stuck and still maintains a good seal with zero-leakage. High-flow capacity and low pressure loss when it is fully opened. High universality and compact in structure. Wide Adjustable range and high adjustable precision. Special order must state the medium and the working condition.